Chromebooks are the hot item in K-12 education, and Dell thinks its second-generation model announced Thursday morning will give it a leg up over the competition. While many Chromebooks being pressed into service in education are mostly consumer-class machines, Dell says the new Chromebook 11 is designed to be “backpack ready” for the harsher environment of education. It's not the only vendor to have figured this out: Samsung went sturdier with its education-oriented Chromebook announced last fall. Dell eschews sleek white plastic and svelteness for a utilitarian design that feels more Soviet than Sir Jony Ive. That includes reinforced edges, a beefy bezel, and even an option for Corning Gorilla Glass over the 11.6-inch TN screen. The Gorilla Glass isn’t to protect it from fingers, either: The company says it found that one of the ways students were breaking Chromebooks was by putting pencils on the keyboard and then closing the screen on it. The Dell Chromebook 11 is designed to take more abuse than consumer models. Another rather unique touch Dell took with it was an LED on the lid of the Chromebook whose color can be changed if the student has a question or wants to collaborate. That same LED also lights up when the Chromebook 11 is connected to Wi-Fi. That can easily let a teacher know at a glance if anyone in the class is using the Internet to, say, play Tanki Online rather than study. The internals are fairly pedestrian. The new Chromebook 11 uses Intel’s Celeron N2840. That’s the same Bay Trail M that’s been powering various Windows machines and Chromebooks for the last six months. System RAM is either 2GB or 4GB of DDR3L and a 16GB of eMMC storage. WiFi is a 2x2 802.11ac, which Dell says is needed for school density, where you can sometimes have several hundred students working online in close proximity. Most school districts will run on Wi-Fi but there are signs that in some cases LTE options may be added for students that live in homes without Internet access. Dell integrated an LTE modem in the Chromebook 11 with the SIM card, in a slot that can be opened only with a security bit. Again, much of this is not new. Samsung’s new Chromebook 2 that it announced in October features a reinforced chassis to deal with the rigors of students, and Acer’s Chromebook 15 announced at CES has a 2x2 802.11ac WiFi. That little LED in the corner shows if little Timmy is on the network instead of doing work in the classroom. Dell says it offers one key selling point others don’t: The ability to manage fleets of Chromebooks 11 in schools using Dell’s KACE management tools. For school admins, that last point may be a key advantage. For school districts that want a little Windows with their computing, Dell also introduced the Latitude 11. Styled similarly to the Chromebook 11, the main difference is in storage. 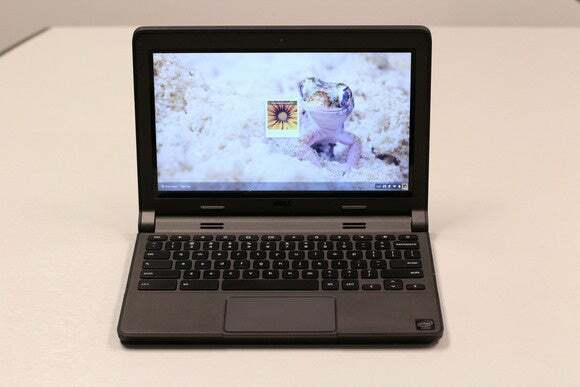 While the Chromebook 11 sticks to low-cost eMMC, the Latitude 11 ships with either a mechanical hard drive or SSD. It lacks the nifty LED function of the Chromebook 11, alas. The new Venue 10 Pro is aimed at the education market and ships with Windows while the nearly identical Venue 10 features Android. Two other education offerings from Dell include the Venue 10 and Venue 10 Pro tablets. 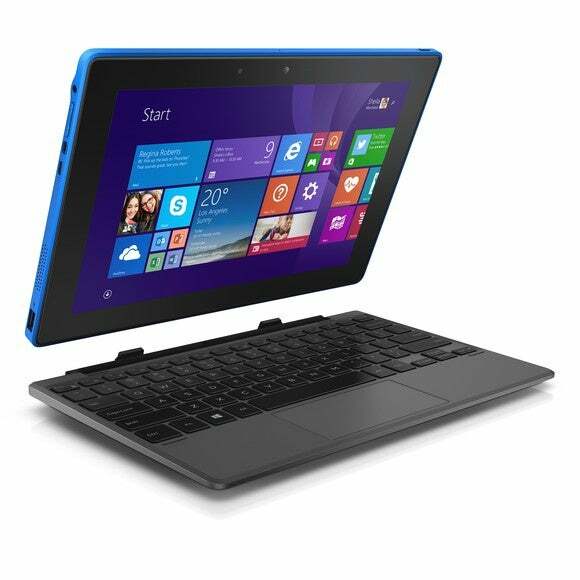 The Venue 10 is an Android-based convertible tablet, while the Venue 10 Pro is Windows 8.1-based. Both run Intel Bay Trail M CPUs. Battery life across all four of the computers is rated at 10 hours of use. The base model Chromebook 11 will be immediately available for $250. The base model Latitude 11 won’t ship until March and starts at $299. The Venue 10 Pro tablet is the priciest of the set and starts at $330, or $380 with the keyboard. Last out the door will be the Android-based Venue 10 in the spring. Pricing and exact release dates for that model weren’t available.